The annual International Armoured Vehicles Conference (IAVs) has gained a reputation as the world’s premier international meeting ground for all elements of the armoured community. IAVs has established itself among the world’s Armies, Marine Corps, procurement officials, and industry representatives as the unbiased quality forum to focus solely upon land vehicles and force protection. The audience grows each year and in 2018 attracted 640 armoured vehicles professionals from 42 nations – including 241 industry experts and 399 military leaders and offered an unparalleled opportunity to share varied experiences in this vital field, at a venue that offers the space to exhibit, confer and network with a wide variety of international colleagues all on one site. 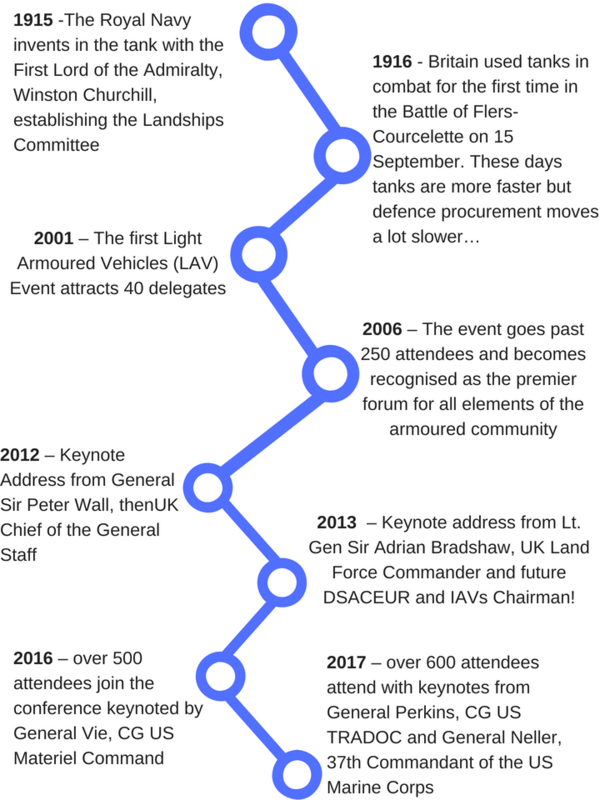 Now in its 19th year, the conference has helped contribute to the debate around many timely subjects over the years; charting trends in armoured vehicles, from the rise of the MRAP to the more recent increase in demand for 6x6 and 8x8 wheeled vehicles.